Right now we are expecting! 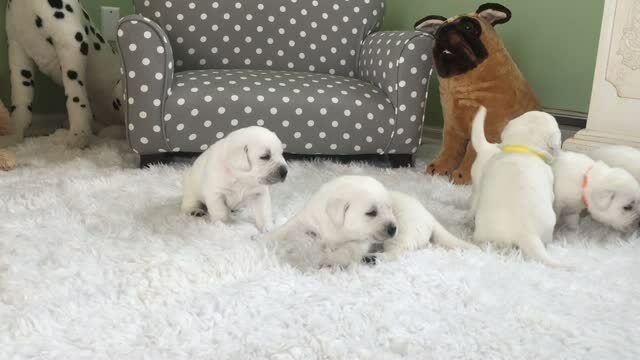 Inquire for more information about our white Lab puppy litters. Selah Bear is due very soon and her puppies will go home in June. Our Puppy Nursery starts off in our Master Bedroom where I can hear their little squeaks and noises 24/7. I coordinate "puppy sitters" and cameras with viewing access from my phone. Your puppy is cuddled and handled daily. As they grow, the puppies are moved to our actual nursery so they can stretch out and roam as much as they'd like. The nursery was designed just for their needs. The walls are light and the lighting is bright, floors and walls are water resistant and security cameras are installed. We have a "potty box" for our puppies so they begin potty training as early as 3.5 weeks old. They have a leg up on most puppies because by the time they go home they are at least nearly, if not already potty trained. A patio door in the nursery leads outside for easy yard access on the warm sunny days. Your puppy is raised in the heart of our home and with much love. Good early experiences are a must! Please fill out our form if you'd like to get on the list for a puppy. There is no greater loyalty than that of the Labrador Retriever. Labs are excellent family dogs. Our focus is to produce well socialized quality English Lab puppies for the purpose of show, service, hunting, therapy and companion pets. Our AKC Labrador puppies are family raised inside of our home. Puppies are born inside of home, it's a great family event with wide-eyed children about while mom and dad have the camera in hand! Together our family socializes them well.